this casual outfit is filled with all of my favorites. my favorite handbag, my favorite jewelry, my favorite denim, my favorite blouse my favorite shoes. oops, i forgot to mention my favorite flowers! 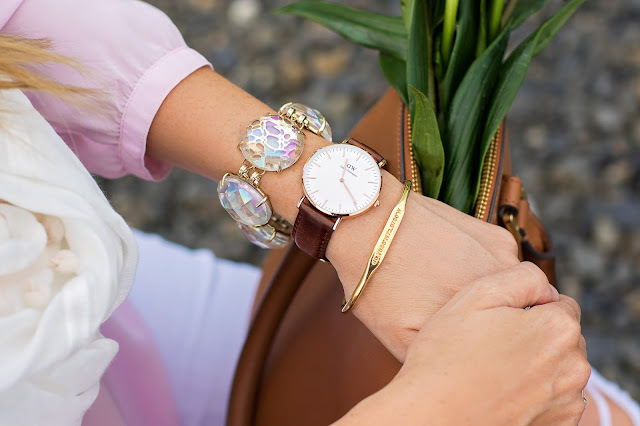 i wanted to make sure and get this post up before this great deal from Daniel Wellington expires. if you use the coupon code BLUSHINGBASICS at checkout you will get 15% off your purchase and for limited time you will also get a free NATO strap with purchase. that is a great savings for a great watch. additionally, this cute lightweight scarf is currently on clearance. it makes a great scarf for summer. light enough to wear but heavy enough to keep you warm on cool summer nights. the sunglasses are still on price-match as well and are the lowest price i have seen them. for information on where to buy the items pictured, check out the widget at the end of the post.